When you are looking for an easy meal to prepare, this chili recipe will come to your rescue. Traditional chili made with beans and a variety of tomato products will most likely kick you out of ketosis, but fortunately, this keto friendly recipe is low in carbs and will also leave you feeling extremely satisfied. It is rich in healthy fats, full of bold flavors, and is so easy to prepare. Serve it alongside some keto bread, cloud bread, keto tortillas, or even in the morning with a few over-easy eggs. One of the best health benefits of grass-fed beef is that it contains more CLA (conjugated linoleic acid) than regular grain-fed beef. This polyunsaturated fatty acid has been known to fight cancer, help build muscle, and reduce the risk of heart disease. Grass-fed beef can also help lower overall cholesterol and contains higher amounts of disease-fighting antioxidants such as vitamin E.
Getting a good amount of healthy fats in our diets helps regulate blood sugar. CLA has been known to help improve insulin sensitivity which helps reduce the risk of diabetes, even if you are insulin resistant. Beef from grain-fed cows is also typically given hormones to help increase their size which provides more meat to sell to consumers. These hormones could pose a health risk to us with an increased risk of different types of cancer. In addition, grain-fed cows are also given antibiotics which can contribute to antibiotic resistance. This increases the formation of drug-resistant bacteria and could pose serious problems when we are faced with a medical concern that requires the use of antibiotics, as they may no longer be as effective. There is also a decreased risk of food poisoning with grass-fed beef and it is considered safer for the environment. Not to mention that grass fed beef tends to be more rich in flavor and is the perfect protein choice for this recipe. 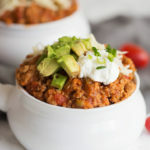 Top this hearty bowl of chili with some shredded cheddar cheese, a dollop of sour cream, avocado, and a sprinkle of green onions for a meal you will come back to over and over again. In a large stock pot or dutch oven, heat olive oil under medium heat. Add onions and bell peppers. Sautée for 1-2 minutes. Stir in garlic, salt, pepper, and spices. Add ground beef and cook until browned. Stir in tomato paste, tomatoes, and broth. Bring to a boil, then reduce heat to low. Cook for 20-25 minutes, stirring occasionally. Top with cheese, sour cream, and avocado if desired. I want to make this but can not see the nutritional facts where do I find them in the recipe I have looked. thanks for the recope! how many servings does the recipe yield? Hi Billy, this recipe yields 5 cups cooked. Hi Rose-Marie, the serving size is 3/4 cup. Made this last night and it tasted great. I just added a couple jalapenos for heat. Good macros for keto also if you do it with 80/20 ground beef. Tried this recipe and I am in love!!!! Is the serving size 3/4 or 1 cup??? Hi Ashley, the serving size is per 3/4 cups. Thank you for putting the serving size in the recipe! I am a Texan, so I am pretty picky when it comes to chili, but this was DELICIOUS! I will definitely make this again and again! Thank you! I thought we would be disappointed with Keto Chili, as my chili usually has lots of elbow macaroni and crackers, but my husband and I loved this chili! Simple to make, full of flavor; this recipe is definitely a keeper, even if we were not Keto! I made some fathead garlic bread to dunk in the chili and it was a perfect dinner for a cold Wisconsin fall day. Thank you! Hi Emi, this recipe yields 5 cooked so if you’d like to make this for 20 persons, kindly adjust the ingredients amount by four. This recipe was soooo delicious. I doubled the broth used ground turkey and turkey broth and crushed red pepper. I don’t normally don’t eat chilli, I made this using turkey burger. This is a dish I will keep in my mind as a go to meal… Very good. We have made several times. I usually add a little bit of green, yellow, orange and red peppers. I even added mushrooms once and substituted deer burger once too. Yummm! I love this recipe. Been making it once a week for the wife and me. I don’t like beans to begin with, so this chili is right up my alley, keto or not. This is the exact flavor I want out of chili. I will continue to cook this even when we are off the keto wagon. I’m vegetarian so I’m going to skip the meat and use vegetable broth instead! I’ll post how it turns out for anyone else who might be interested! Just made this tonight. First time I EVER made chilli -low carb or otherwise. It is absolutely perfect! The spices are just right. Thank you so much.